Muller wants to re-launch Saab and make Spyker a top 5 supercar brand. Spyker Cars CEO Victor Muller has remained true to his company motto "nulla tenaci invia est via -- for the tenacious no road is impassable" during months of difficult negotiations with Saab owner General Motors Co.
Muller achieved his goal of buying the iconic Swedish brand on Tuesday when GM said it was selling Saab to Spyker for $74 million. GM twice rejected Muller's offers for Saab late last year because of financing concerns, but Muller drew up a final, third bid in December to address GM's concerns. But his task became even more difficult after Luxembourg investment company Genii Capital made an 11th hour offer for Saab backed by Formula One boss Bernie Ecclestone, whose net worth is estimated at $3.7 billion by Forbes. Genii's spokesman Lars Carlstrom all but conceded victory when he said that Spyker had a head-start of at least four weeks in completing work toward a deal with GM. However, he added that Genii and its partners remain ready to pursue talks with GM if the deal with Spyker falls through. Muller has said Spyker's efforts to buy Saab are based on "our passion for saving an iconic brand that we would be honored to shepherd, and the jobs and livelihoods of thousands of loyal Saab employees, suppliers and dealers around the world." But Spyker, an unprofitable Dutch boutique brand which builds less than 50 luxury cars a year compared with Saab's annual production of nearly 100,000, has a lot more to gain than honor and the gratitude of Saab employees and enthusiasts. Saab will bring Spyker a strong, global distribution network with 1,100 dealers, state-of-the-art production facilities, a skilled work force and solid engineering, sourcing and r&d capabilities. Muller says his company will give Saab the financial backing required to compete as a competitive global brand, along with an entrepreneurial leadership team sensitive to the uniqueness, heritage and individuality of the Saab brand. Spyker will take Saab back to its roots as the premium brand of choice for free-spirited car buyers who want to stand out from the crowd, Muller says. "We can add managing skills to help Saab rediscover independent brand development for an alternative premium product, something they used to do many years ago," Muller told Automotive News Europe in an interview in December. Saab's all-wheel-drive expertise will also help Spyker introduce an SUV as a second model line. A production version of the 9-4X, shown here as a concept, will be a core Saab model. "Spyker cannot live just from sports cars," Muller told ANE. "With Saab we could use their all-wheel-drive expertise and other synergies such as their purchasing abilities and Saab's global dealer network." 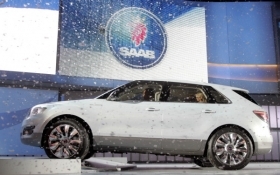 Muller sees similarities between Saab and Spyker, which both diversified into building cars from making fighter planes. In an interview with AOL Autos Muller said Spyker will rebuild Saab around the 9-3, 9-5 and 9-4X models while plans for a Saab 9-1 entry-level car would be put on hold. He said Saab would maintain its headquarters, engineering and production in Trollhattan, Sweden, under Spyker's ownership. Trollhattan will produce all Saab cars except the 9-4X, which would be produced in GM's assembly plant in Ramos Arizpe, Mexico. Saab will press ahead with the launch of the new 9-5 sedan this spring while the 9-4X crossover, which shares mechanicals with the Cadillac SRX, would be introduced late next year or early in 2011. A new 9-3 would go on sale in 2012. GM will continue to produce powertrains for Saab and provide engineering. Spyker was founded as a builder of horse-drawn coaches in 1875. In 1903, the company created the world's first car with a six-cylinder engine, which also had permanent all-wheel drive, a second world-first innovation. After World War I, Spyker ran short of money and went out of business in 1925. Muller, a 50-year-old Dutch lawyer and businessman with a passion for top-end classic cars, relaunched Spyker at the British motor show in 2000 after teaming up with car designer Maarten de Bruin. De Bruin had built his own dream car, a two-seat coupe which he called the Sylvestris, in the garage of his home in the village of Gorsel, 100km east of Amsterdam. Spyker made an 8.72 million euros net loss in the first six months of 2009 and its sales fell by 1.6 million euros to 4.1 million euros compared with the year before. In a presentation to the Automotive News World Congress on Jan. 18, Muller said his ambitions for Spyker were to successfully re-launch Saab and for Spyker to join Ferrari, Aston Martin, Lamborghini and Bentley among the top 5 luxury super car brands. Those who know Muller say he is ambitious, passionate, creative and he has an unstoppable drive to reach his goals. Losing is not a word in his vocabulary. Now he has a chance to show he has a winning formula for Saab.